After changes in a process it is necessary to revise the control limits. On the worksheet, alongside the Phase column, click the drop-down arrow, then select the OQ check box, and click OK. 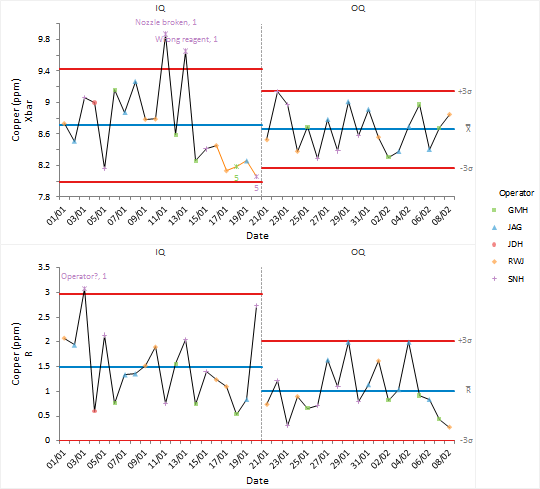 The data is filtered to the IQ and OQ phases. On the Analyse-it ribbon tab, in the Process Control group, click Phases. In the analysis task pane, the By drop-down list is displayed. In the By drop-down list, select Phase. On the Control Chart panel, select the Show process parameters check box. New control limits are computed for the new phase of the process. You can see the limits are much narrower and no-special cause variation is present.